We love our rv's small size. It's easy to drive, maneuver and park almost anywhere. We knew it would be a small space for five of us, but our View is so well designed that we always have plenty of room (for us). Despite teaching our kids how to conserve and use "camping water" when washing their hands, or flushing, it's almost inevitable that we will use our fresh water tank up within 2-3 days of camping. These kids get DIRTY!! And I like my RV kept (relatively) clean! So nightly (quick) showers are a must for us. I mean this is the face of a happy, dirty kid that NEEDS a shower. Since we do a lot of camping at national, county or state parks, we don't often have full hookups. If our camping spot is near the water spigot, we can use our longer water hose and fill directly to the rv. Otherwise, it means moving the rv every few days to re-fill with fresh water. That is do-able, but kind of a pain in the neck. 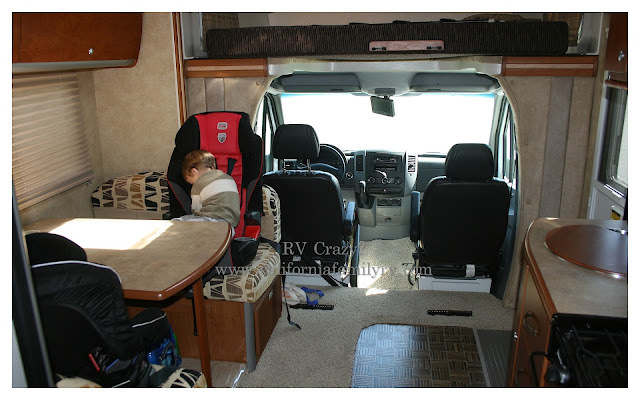 Moving means re-securing all of the items in the rv, rounding up the kids, putting in the slideout, and re-leveling the rv when we return to the space. Again, kind of a pain. But this is what we did the first few times we camped. But then I read about a way to fill the water tank using your winterization valve. Winterization? What the what? Being from Arizona, then moving to California, and being new to rv-ing, I had to read to find out what winterazation even meant! haha. Anyway, the siphoning system works! And it's easy! First, make sure your water pump is off. Next, fill your water container with clean, fresh water. Locate your winterization valve with the tube leading out from it. Ours is located in the cargo compartment under the master bed. Take the cap off the tube, and put the tube inside your clean water container. Make sure it goes down as close to the bottom as possible. If you set the water container on a chair, table, or wagon it's easier to get the tube all the way to the bottom without straining yourself holding it up! Turn lever on winterization valve to "winterize" setting. Turn lever on your regular water tank to "tank fill." You should hear the tube sucking water from the container. Have someone inside let you know when your fresh water tank is full. It only takes a short time, and voila!! Showers are back in business! But remember...all that fresh water must go somewhere! Here are some tips on conserving water and managing your black and gray tank levels.